Esce tra pochi giorni in cd l'importante nuovo lavoro di Kate e Mike Westbrook The Serpent Hit, ciclo narrativo e musicale ispirato ai temi del declino dell'umanità e della distruzione del pianeta, presentato in concerto già in un paio di occasioni - il debutto fu nell'aprile 2011 - e qui proposto in una registrazione di studio perfezionata poche settimane fa con l'aiuto e la supervisione di Jon Hiseman. Chris Parker ne illustra succintamente i contenuti per LondonJazz, commentando: "Beautifully illustrated by Kate’s cover painting and flawlessly and enthusiastically performed by a crack band, The Serpent Hit, despite its ostensibly grave subject matter, is – somewhat paradoxically – an inspiring and oddly uplifting listening experience. 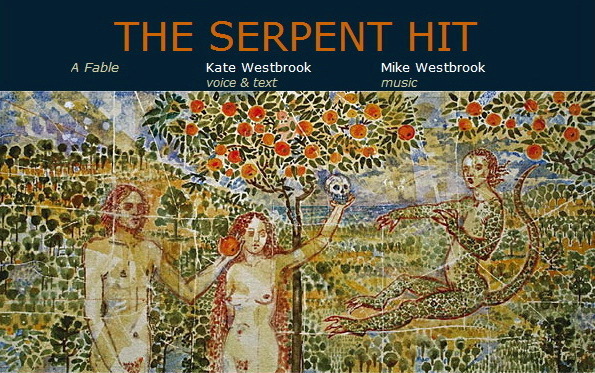 The Westbrooks have never been afraid to address the ‘big issues’ – their profound and deeply moving meditations on the Great War in the London Bridge, for instance, should surely form part of any self-respecting forthcoming public commemorations of that earth-shattering conflict – and The Serpent Hit, infectiously lively and immediately accessible as it is, constitutes another considerable artistic triumph for them". L'album inaugura ufficialmente l'etichetta Westbrook Records: informazioni in dettaglio sono in www.westbrookjazz.co.uk/serpent/index.shtml.